No More Messy Impressions with Your Dentist! Whether we’re restoring a tooth with a dental crown or giving a patient a smile makeover with porcelain veneers, both procedures have one step in common: we need to take an impression of the teeth. This allows us to have a model of the bite so we can specially design each patient’s treatment to perfectly suit their smile. In the past, this was done using odd tasting dental putty, which a patient needed to literally bite down into. If you’ve ever had a traditional impression taken, then it likely wasn’t your favorite experience! Thankfully, your dentist at The Dental Center of Westport can now keep the putty safely locked away because of our new intraoral scanner. With it, your experience with us won’t only be more comfortable, but faster and more effective as well. Our intraoral scanner enables us to get the best possible look at your teeth without us actually having to put our hands in your mouth. It is a small, handheld device that we can easily maneuver through the mouth to capture dozens of unique images of your teeth. On a nearby monitor, you and your dentist can watch as software seamlessly “stitches” these images together to create a fully-digital 3D image of your teeth. The entire process only takes a few minutes or less, and it will literally give you a whole new perspective on your smile. More Comfortable Impressions: The dental putty used for traditional impressions usually gets everywhere and causes many patients to gag, creating an overall unpleasant experience for both the dentist and patient. Now, the entire process can be completed easily without a speck of putty in sight. Faster: As we touched on above, creating a digital impression of your teeth only takes a few minutes if that, leaving more time for your dentist to explain what they are seeing and answer your questions. More Accuracy: Not only is using the intraoral scanner faster and more comfortable than the traditional way, but it also yields a more highly-detailed impression. This helps your dentist gain valuable information about your particular teeth so they can better customize your treatment. Faster Turnaround: When working with a traditional physical impression, your dentist would need to mail it to a dental lab in order to have your restoration fabricated. As you can imagine, this process could take days and significantly lengthen overall treatment time. With our intraoral scanner, the impressions are entirely digital, which means they can be instantly emailed to a lab so they can get to work as quickly as possible and you’ll get your final restoration much faster. Our intraoral scanner is just one of the many advanced tools we use every day to enhance our patients’ care. Thanks to the latest dental technology, we’re able to address an even wider array of problems in less time while keeping our patients more comfortable. What’s not to love about that? 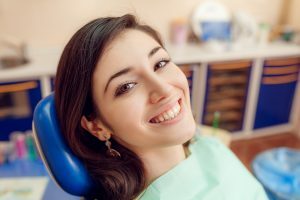 If you’re ready to experience the very best that modern-day dentistry has to offer, then all you need to do is visit The Dental Center of Westport. We’ll make sure your appointments fly by and that your results are always beautiful. To schedule an appointment, contact us today. Comments Off on No More Messy Impressions with Your Dentist!